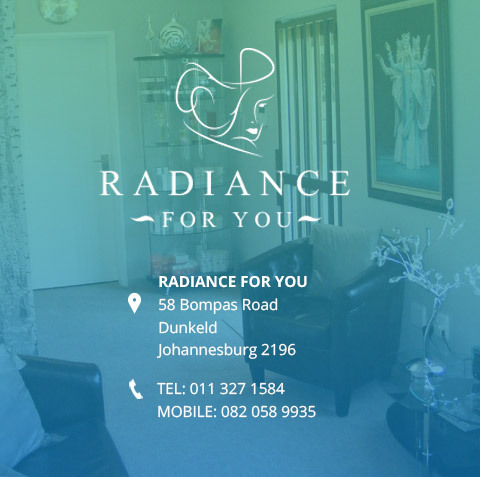 Radiance for You clinic uses the e-Max aesthetic system that combines the power of optical (light and laser) and radiofrequency (electrical) energies. 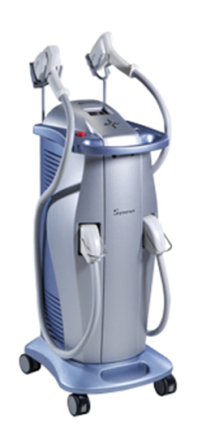 The eMax platform delivers the most comprehensive range of aesthetic applications: laser hair removal, skin rejuvenation (IPL), skin tightening, non-invasive fractional laser and diode laser for wrinkle reduction, to successfully treat the broadest spectrum of hair colours, skin textures, and skin tones. The eMax treatments are FDA (Food and Drug Administration, USA) approved. The combined energies (electrical and optical) of the eMax platform allow the use of significantly lower light energies compared to other systems and thus provide superior safety (extremely low risk for redness, blistering or burning even on darker skin tones). The use of radio frequency compensates for lower light energies and provides maximum efficacy of the treatments. The eMax aesthetic system empowers us to meet patient demands for non-invasive aesthetic improvements with minimal or no downtime (i.e. no side effects and recovery time). The Matrix IR™ fractional laser is the only applicator that combines a diode (915 nm) laser matrix and bi-polar radio frequency (RF). Use of this combination of modalities results in overlapping light beams penetrating deep into the dermis to a depth of up to 2.5 mm to pre-heat the target tissue. RF energy, which is issued at the same time as the laser light, causes additional heating of the dermal tissue. During treatment with THE Matrix IR™ fractional laser, the combination of laser energy and conducted RF energy induces skin injury that is maximized in micro-thermal zones (regions of greatest energy intensity) with an accelerated healing process supported by the tissue surrounding the micro-thermal zones. As a result of heat, the wound healing process is initiated in the dermal (deep) layer of the skin, and fibroblast cells responsible for tissue repair start to produce new collagen and elastin molecules. This compensates for collagen and elastin loss caused by ageing and therefore, the volume of dermal tissue increases again with each treatment and “fills-up” lines and wrinkles. Additionally, deep thermal heating created by the synergy of laser and RF energies induces shrinkage (so called collagen remodelling) of existing dermal collagen and thus provides an immediate improvement in the appearance of lines and wrinkles. Similarly to other eMax treatments (e.g. skin rejuvenation (SR) and skin tightening (ST)), the Matrix IR™ fractional laser is preceded by microdermabrasion (MDA). The eMax aesthetic system allows combining Skin Tightening and/or Skin Rejuvenation treatments with the Matrix IR™ fractional laser in one session (see “triniti™ treatment”). This combination approach accelerates and enhances the results of the anti-ageing treatment on different layers of the skin. The Matrix IR™ treatment is safe to perform on the darker skin tones, including Asian, and is also safe to use on men – it does not destroy hair follicles. Matrix IR™ fractional laser can be applied to the face, neck, décolleté and other parts of the body. 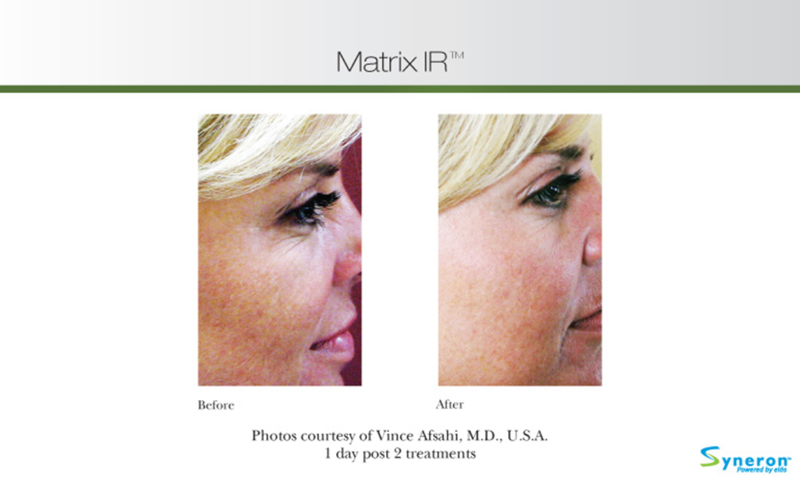 What can be treated with Matrix IR™ fractional laser? Matrix IR™ fractional laser is ideal for treatment of deep skin depressions, lines and fine to moderate wrinkles. 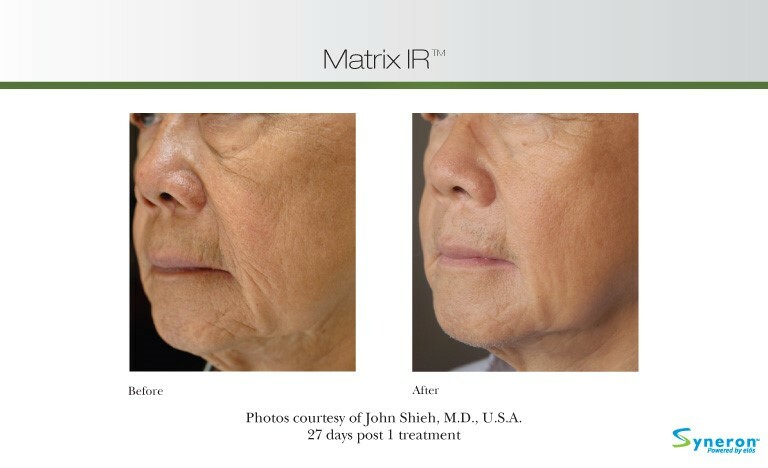 Matrix IR™ laser in combination with MDA and other types of elos treatments (IPL FotoFacial RF™ and/or ReFirm™ skin tightening) shows visible improvement in the appearance of stretch marks and acne scaring. 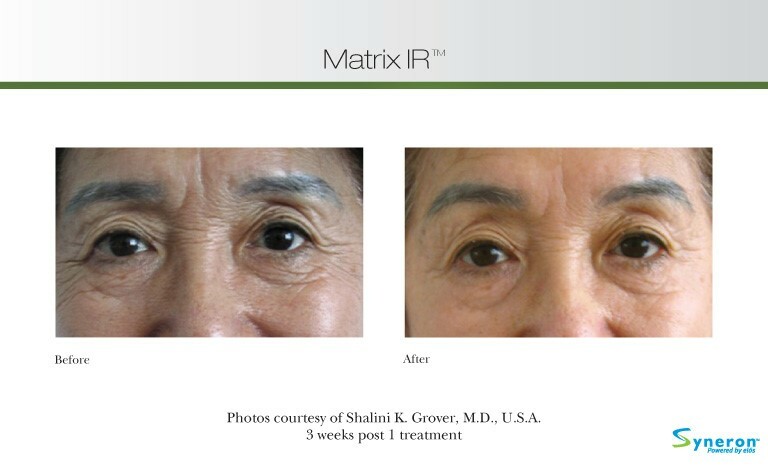 How many Matrix IR™ treatments do I need? Noticeable improvement is often achieved after the first procedure. For best results 3 to 5 treatments are recommended every 4 to 6 weeks. Maintenance treatments are recommended every 6 to 12 months. 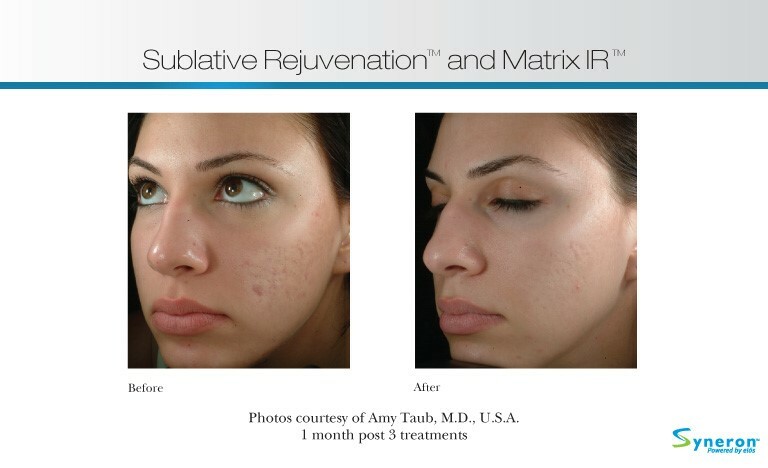 What happens after each Matrix IR™ fractional laser treatment? The Matrix IR™ fractional laser has a unique feature – it is completely non-invasive (non- ablative), i.e. it does not disturb the surface of the skin, and leaves no marks or scabs, unlike other ablative fractional lasers. The Matrix IR™ applicator is supplied with intense epidermal cooling to protect the top layer of the skin and make the treatment more comfortable. Considering the non-invasiveness of the Matrix IR™ treatment, there is no down – time (i.e. it is a lunch time procedure) and no local anaesthetic is required. After the procedure a few patients may exhibit mild short-term local reddening. Mild swelling is normally expected. As we described earlier (see “About the treatment”) there are two mechanisms by which both skin tightening and fractional laser improve the appearance of aged skin. The main mechanism is through stimulating the synthesis of new collagen and elastin and this process normally takes up to 4 weeks. The second mechanism that provides an immediate improvement in skin texture and reduces the depth of wrinkles is due to shrinkage (remodelling) of the existing collagen. The process of collagen remodelling is temporary, and normally reverses by the time the new collagen and elastin has formed. Laser and light therapies are contraindicated during pregnancy and nursing.